So I want to keep up the blog chronicling, but I’m not feeling motivated to go into detail about my arts exploits this past weekend. So I guess the answer is to do a paragraph and see what happens. Friday evening September 12 brought my first visit to the Village Players of Birmingham back up in my now-neighbor Oakland County. Their current production, Women on the Verge of a Nervous Breakdown, is an adaptation of the same-titled film by Pedro Almodovar. I’d heard about this musical when it appeared on Broadway in late 2010, but it was not a huge success there, and doesn’t seem to have picked up steam on the regional circuits, so props to Birmingham for choosing to showcase it as their season opener. I have also followed some of Almodovar’s work (and briefly met him personally in 2007), but have never seen this film. This was a gutsy production paying direct homage to Almodovar’s love of bold colors, Spanish women and passionate characters. Costume design highlighted the aforementioned colors, with lots of reds and big 80s hair. Set design was an interesting hybrid of small and large scale, with the company’s modest proscenium stage decorated with pop-art style drawings on the walls and small suggestions of living areas in the forefront of the stage. As well, the orchestra was creatively nestled in above the play-space and behind a wall. The large ensemble cast seemed pleased to be giving voice to such enthusiastic material, with the actors in the central roles standing out. But the script remained flimsy and tangential, with a meandering plot switching around to multiple characters, and little time devoted to creating a central protagonist. Often it seemed that when allegiances could build to one specific character, it was time to switch over to another one. Or, a different, and less likable character would take over the focus from someone that seemed more interesting. Nonetheless, a fun show and great excuse to see a new to me company. Saturday night brought a trip over the border to see Howie Mandel perform at the (overrated) Caesars Colosseum. I could write a separate entry about the challenges of this particular performance venue… Roy summarizes them well. I was not pleased that it took nearly an hour to depart the complex, between a protracted awkward group shuffle out of the auditorium, going back through the casino complex, and then slowly snaking down the levels in the crowded free parking garage. I’ll keep my eye on the future offerings at Caesars, but might think twice before actually going in there again. Happily, Mandel offered an upbeat and “extended” routine for the receptive audience. The native Canadian was clearly excited to be back in his home province. He didn’t offer too much personal background (a feature in a Michigan City newspaper about his previous night’s performance did) but that may have been due to his excitement over becoming a grandfather earlier that day which, naturally, was a big topic in the first half of his routine. The “homecoming” theme stuck throughout the one hour or so long performance, where Mandel didn’t seem to shy away from being personal, yet funny, and treated the audience like his friends. Towards the end of his performance, he claimed that we were even getting an “extended version” because of being there in Ontario. And he gave a brief nod to his iconic Bobby character, which was my first introduction to his work. 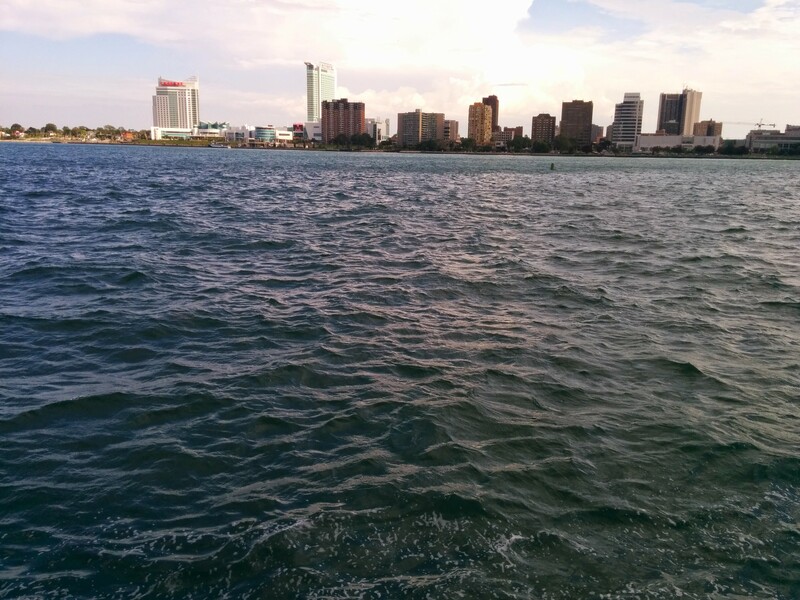 The Windsor skyline as seen from Detroit, with Caesars visible at the far left. Sunday brought another trip over the border, this time at the “northern passage” Port Huron/Sarnia crossing point, bound for the iconic Stratford Festival and a long-overdue (for me) first visit there. I was pleased that this trip came about through my new community at Wayne State University and is an annual excursion. Initially I was not excited that our play of the day would be the overly familiar Midsummer Nights Dream. But this version dared to be modern with the material, incorporating such timely topics as gay marriage, deaf characters, multiple ethnicities and cross – gender/nontraditional casting freely into an exuberant take on the well – known tale. The production also offered the strongest take on the Theseus & Hippolyta scenes that I’ve ever seen, thanks to committed work from stellar actors. The Stratford experience, clearly designed to be similar to its UK sibling/cousin, is also a winner, with the festival theatres located just beyond a wider than you’d expect downtown area, with most shops clearly, but cheerily, catering to the festival’s tourist trade, and taking care to ensure that the patron’s experience is a memorable one.